06/23/2016 – Steam Summer Sale is Here! All DLCs on Sale! 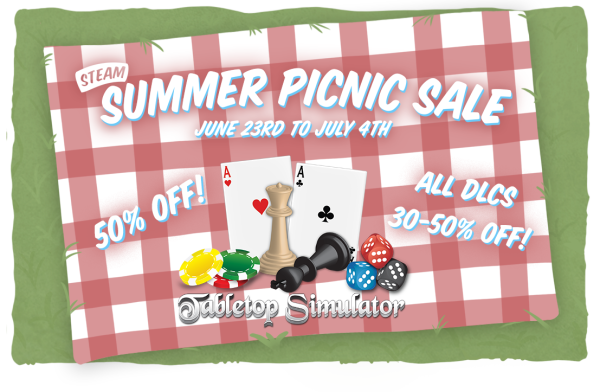 The Steam Summer Sale is here and Tabletop Simulator is 50% off! You can also find all of our DLCs on sale with discounts varying from 30-50% off! This is a great time to pick them up if you’ve been thinking about it. And remember, only the host needs to own the DLC. Enjoy playing your favorite games with our added VR support with the HTC Vive as well! Both VR and regular players can play together! Have fun!